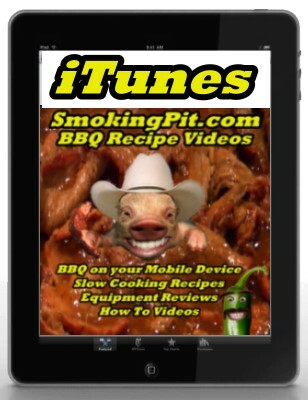 SmokingPit.com - BBQ Smoking Recipes and Reviews Rubs Sauces Smokers on Free iTunes podcast video and apps. This is and will remain a free site. However should you find this site useful and wish to donate, your donation is welcome and appreciated. All donations will go to hosting and site maintenance fees. Videos are now available on the iTunes Store! Taking BBQ seriously and Taking BBQ Mobile!